We have an engine shunting at a docks. But which docks? Not much to go on with this one. 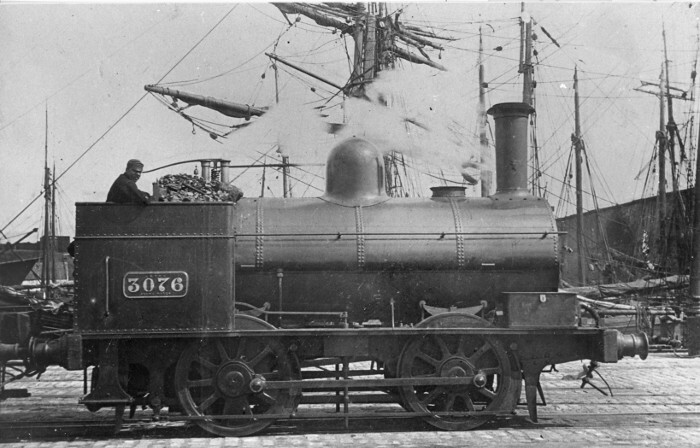 The engine (built Jan. 1864) carried this number 3076 between Feb/March 1891 and its scrapping in Sept 1905. I think there is a lamp socket in the middle of the front bufferbeam; if so the date would be 1903-1905. From the sun's position, the engine seems to be facing more-or-less south, so as to location my (wild) guess would be Birkenhead, and if the dark area at the right is a warehouse, maybe this is the west end of Wallasey Dock. Facing SW in the afternoon. The 1908 map shows the original turntable and train shed roof to have been removed in the 1899 rebuild. The roof of the building on the right has 'burnt out' on the photo. The structure to the left and behind of the loco is part of the coal stage jetty. There is some optical distortion in the depth of field.